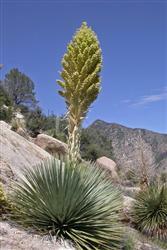 This agave looks very similar to a Yucca plant but has more flexible leaves. It has a long stalk of white flowers that appear every spring. This plant looks stunning as an accent in any garden but also looks fantastic in a desert garden. It is also attractive to birds and would make a stunning addition to a bird garden with sandy or rocky soil.